I just added to Wammu support for SMS recipient lists. For now there is no interaction with possible lists in phone, but you can create and save your own lists. Lists are saved in plain text files, one phone per line. I guess such list will be easy to create from any application. PS: I hope this feature won't be used for SMS spamming :-). Published on March 4, 2007, 7:39 p.m.
Now I'm in state when I'm deciding what to put to next Wammu version. This is always hard, because I don't get any feedback from most of users. I sometimes find note in random forum, that user wants dock icon. Anyway I'd really appreciate some feedback in bug tracking system. Write there features you would like to see or post comments to existing reports, that you want to see this feature. This will help me to choose which one to implement in upcoming Wammu version. You can see what I've chosen for now in bug #252. Published on March 2, 2007, 4:31 p.m. Better setup.py to use more of distutils. .mo locales are generated on build and not included in VCS. Show only existing devices on Windows (this requires pywin32). Now requires wxPython at least 2.6.2. 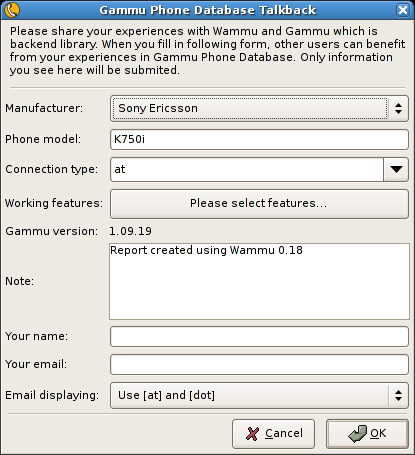 Support for reporting in Gammu Phone Database. Automatically asks user for feedback after month of usage. GUI more follows HIG on target platform (button placement). Use gammu configuration for phone connection instead of own. Yes you read it correctly, here finally comes Wammu with configuration wizard and talkback to phone database! Besides this huge change, this release will make also Windows users happy, because it finally contains current python-gammu and Gammu. Published on Feb. 24, 2007, 2:33 a.m. Fix crash on wrongly configured locales. Published on Feb. 23, 2007, 11:01 p.m.
Added include paths to MSVC configuration files. Support for sending file to phone (--sendfile). Russian translation update (Acid Jack). Fixed possible uninitialised value in date decoding (Stanislav Brabec). Fixed reading of contacts from Samsung. Fixed vCard handling for Siemens (bug #72). Stay tuned, release weekend will continue ;-). Published on Feb. 23, 2007, 10:07 p.m. I still more and more think, that I should move out of Bazaar to some more maintained piece of software for version control. The biggest problem I currently see, that I was not able to convert by Bazaar repositories to some other format. I tried to convert to Bazaar-NG by booth BzrTools and Tailor, but none of them succeeded, then I tried conversion to Git, but Tailor failed also on this task. Maybe I will try Subversion, which is now very widely used software, although it has some annoyances. I originally wanted distributed VCS, because I was often offline at home, but this is not the case anymore, so using centralised VCS on my own server should not be a big problem. Published on Feb. 23, 2007, 11:48 a.m. Yesterday, I hacked last part migration to new Wammu configuration scheme (Wammu now does not have separate configuration to Gammu, but shares it) together with brand new [configuration wizard]. Before I release all those major changes as 0.18, I'd like to have some feedback what this change breaks. There is lot of new code within this release and I'd really like to avoid releasing 0.19 shortly after this just because some stupid error. So if you have time, please download snapshot and try to work with it for a while. Report found problems to bug tracker. Thanks! Published on Feb. 16, 2007, 9:44 a.m. Published on Feb. 8, 2007, 7:38 p.m. If you are not Czech speaking, you can safely ignore this post :-). I just hacked another script for creating StarDict dictionary from outer source. This times is it dictionary of Czech foreign words. You can find it on same page as English-Czech dictionary. Published on Feb. 7, 2007, 10:43 a.m.